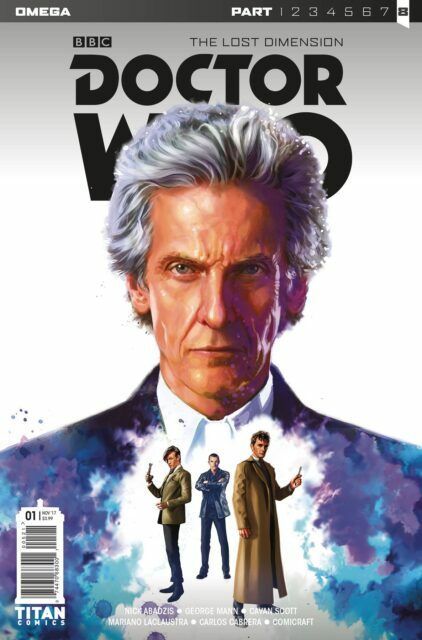 Next week Titan Comics’ Doctor Who: The Lost Dimension comes to an end. The Lost Dimension is an eight chapter multi-Doctor story that features all thirteen Doctors (including John Hurt’s War Doctor), River Song, and the Doctor’s daughter Jenny in one epic storyline with the fate of the universe at stake. It is also Titan’s third multi-Doctor event in three years. We Doctor Who fans have been spoiled for multi-Doctor stories the past five years. On television we had “The Day of the Doctor” in 2013 and, at Christmas we’ll see “Twice Upon a Time.” In audio we’ve had The Light at the End, the fiftieth anniversary story with the pre-modern Doctors, and the audio adaptation of Lance Parkin’s Cold Fusion. In comics we’ve had Prisoners of Time, Four Doctors (which actually had six), and this year’s The Lost Dimension, not to mention guest appearances by the twelfth Doctor in the tenth Doctor series and the eighth Doctor mini-series. I should note, Supremacy of the Cybermen is not a multi-Doctor story; yes, there are multiple Doctors in the story, but they never met or interacted. Similarly, the War Doctor, though he appeared in the eleventh Doctor comics, never met the eleventh Doctor, though his companion Alice did. These aren’t true multi-Doctor stories. Rather, they’re stories with multiple Doctors. The point is, a multi-Doctor story, which used to be a rare thing that happened every few years feels like a regular occurrence. Tie-ins, like the comic books and the audio dramas, make staging a multi-Doctor story far easier than they were on television, but just because you can do something doesn’t mean you should do it over and over, hammering it into the ground. Seeing different incarnations of the Doctor interacting, the same person but different bodies, is fun, don’t get me wrong. But multi-Doctor were also special because of the rarity. They’re so common now that they’re no longer special. I wouldn’t mind if something new and interesting were done with bringing multiple Doctors together. Maybe the fate of the universe doesn’t have to be at stake. Maybe the Doctors don’t need to have their memories magically disappear. Right now, I’m feeling multi-Doctor burnout. And considering there’s another multi-Doctor story coming out this year, the aforementioned “Twice Upon a Time” at Christmas, being burned out on multiple Doctors doing the Doctor Who thing isn’t a great place to be. Next Next post: Swampoodle, in Color!